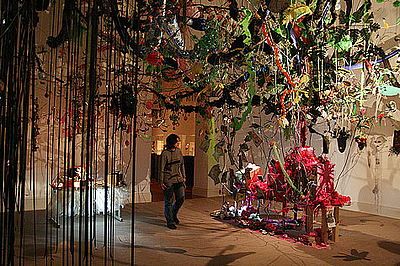 Contemporary art and exhibits from Africa, Asia, Oceania, the tropical America. 85 works of contemporary art by 39 authors along with 200 exhibits from Africa, Asia, Oceania and the tropical America from the collections of the Ethnological Museum in Berlin. Following the highly successful presentations in Brasilia and Rio de Janeiro, with more than half a million visitors, a considerably extended version of the exhibition will be on view in Berlin. 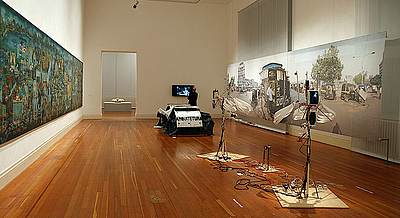 The joint project of the Goethe-Institut and the Ethnological Museum Berlin spans an arch from the premodern, precolonial times up to contemporary artistic positions, proposing "to explore in troubled times the currents of energy and subtle discords between the hemispheres, to show which cultural forces are working in harmony and which in opposition to one another. The exhibition aims to create an incorruptible, crisis-resistant stock of images that permits a non-hierarchical view of the world." Alfons Hug, the project's initiator, writes in his catalogue text, among other things: "Since it is an art exhibition, the selection of the older works was primarily based on aesthetic and not on scientific criteria. 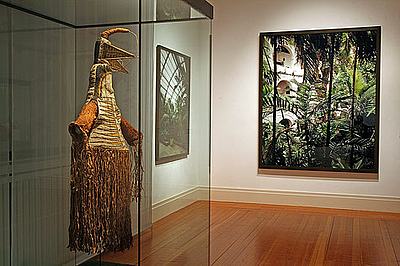 The general idea is to re-aestheticize the subject of the tropics, not to look at them from a political and economic viewpoint for once, but to concentrate on culture as a counterweight. Instead of one-dimensional debates on poverty (or hunger, or violence, or political crises) or crass generalizations we are offered a glimpse of the artistic complexity and aesthetic richness of the tropics in a way that promises to change the terms of the North-South dialogue. This will free the South from the trap of always being seen in a bad light, while the North’s insistence on explaining the world in economic terms can be put into proportion, thus paving the way for a genuinely cosmopolitan and multi-perspective view of the world in the Humboldtian sense." The Tropics. Views from the Middle of the Globe is also meant as a way station on the road to the Humboldt Forum, which is planned on the Schlossplatz (square of the former castle) in Berlin's center, with the aim to present non-European cultures on a par with European cultures. 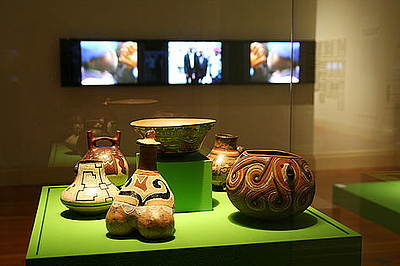 Goethe-Institut and Ethnological Museum - National Museums Berlin. Supported by the German Federal Cultural Foundation.